I’m giving away some more free stuff so the Internet will love me. Love me, Internet! Love me! I am the uncle you never see who tries to buy your affection with snow globes from Florida! 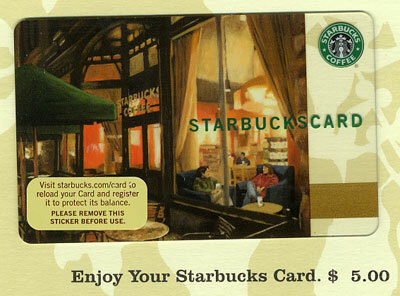 I’ve got seven Starbucks cards worth $5 each that I will give away to seven randomly selected readers. To enter, leave a comment on this entry specifying what you’ll buy with your $5 card, which could be a coffee or an item from their new line of breakfast items. Yesterday I had the pumpkin and cream cheese muffin and it almost made the pain of the day go away. Almost. ETA: This is open to international readers too, though I don’t know if the cards work internationally. It would also help if you actually have a Starbucks near you. ETA: Whoops, I forgot to set a deadline! Comment on this entry by 11:59pm on Sunday, October 12 to qualify. Caramel machiatto. Do we really need anything else in life? I think not. Although, the pumpkin cream cheese muffin would be a nice accompaniment!! i even made my email legit. not to be a jerk and just post on this entry. i read the other ones, too. oh, oops. i would get one of their fruit stella things. A 16 ounce, sugar-free vanilla latte with skim milk. Mmmm. I love the fall items at Starbucks. I am all about their pumpkin cream cheese muffins with a caramel apple cider. Yea for fall! mmm. steaming venti bold brew of the day, black. it’s the fastest way to feel like a human in the morning. hope everything is going well for you, love reading your posts. A very delish and horrid caramel macchiato! Yum!! Pumpkin spice latte, of course! Decaf skim peppermint mocha – but WITH the whipped cream and chocolate shavings. Really, it’s the one and only thing I like at Starbucks. A pumpkin spice latte! I dream of these when they’re not in season. I haven’t had one yet this fall, so I’m definitely looking forward to it. Venti Unsweetened Ice Green Tea and a Spinach Feta Wrap…it’s a wee bit over 5 bucks but I can cover the rest. Just bought your book and it came in the mail yesterday- started reading it right away! Coffee and a book- my favorite thing! Pumpkin Spice latte all the way. YUM. I want to try their new oatmeal! coffee… black…or maybe just a travel mug. COFFEE!!! Two of them, as a matter of fact. I’d even have 70 cents left over for … a crumb of something? I don’t know. I’m not addicted at all, no. Definitely would get a pumpkin spice latte (the essence of autumn in one drink – how can you beat that? ), and a toffee almond bar! Pick me, oh random number generator! If I win I’ll buy the biggest Pumpkin Spice Latte money can buy. Gluten Free! Love the blog, by the way. And the book! I would buy a non-fat Pumpkin Spice latte. I love fall flavors. Well, since I’m pregnant, it’ll have to be a decaf for me. I think I’d have to get a decaf skinny cinnamon dolce latte with a Splenda. I’d probably buy my usual: nonfat latte. But I might throw some protein in there, and make it a mocha if I was feeling especially decadent that day. The new Signature hot chocolate with whipped cream and cinnamon sprinkled on top to help get myself through the cold New England winter. Strawberries and Creme! Mmmm… I could branch out and try a different flavor, but why when that one is SO GOOD? I really want to try their new oatmeal with dried fruit mix-ins! I’d get a vanilla chai latte!! A hot chocolate for me, caramel apple cider for my husband. Oooh, good question! I’d get a nonfat latte, and if I was feeling skinny that delicious pumpkin cream cheese muffin, or if not so skinny, the power protein plate. I’m all about the raspberry skim lattes. yum. I definitely will NOT be getting any pumpkin scones. they are delicious, but not worth the 600 calories. evil. Caramel macchiato. Ahhhh, caramel macchiato. Since I”m down to $4.00 in my checking account (sigh…pay day is tomorrow) I would order a Tall non fat decaf latte and use my coupon I have for a free bowl of their new oatmeal! Yum! Yes, I can survive the economy-my new mantra. I’d so buy a light Pumpkin Spice Frap…mmm…I love the Fall! Yep – coming out of lurkdom for the chance at $5! I think I’d try the Protein Plate. Or something with lots of chocolate. I’d save it until Christmastime and get one of their Peppermint Mochas. That’s my absolute favorite thing at the ‘bucks. I have not tried the pumpkin muffin yet – sounds yummy! I’m a Starbucks newbie, so I would use it to buy something other than the hot chocolate I always get! Maybe something with pumpkin..
I’m hoarding ww points to have a pumpkin scone with yummy frosting and pumpkinny goodness… and vitamin A, right? If that plan falls through, I do love a skinny hazelnut latte and I might try the oatmeal. I appreciate healthier options and think that the restaurants offering them should be rewarded with my patronage! I love a tall nonfat vanilla latte. I know that’s probably the boringest drink the make. What can I say? I like vanilla. Since I’ve officially lost 15 pounds and have been to the gym at least 4 days a week for the past bit, I would totally use it as a cheat card and get a double chocolate chip frappe. Pumpkin spice latte! Although the pumpkin cream cheese muffin sounds yummy too! Well, I live in the subtropics, so if they still have their frozen lemonade, I will get that. If not, perhaps one of those pumpkin and cream cheese muffins will put me in the fall mood without cold air and turning leaves……. Or maybe the pumpkin spice latte. Or the peppermit mocha latte. All of the above would be skim, of course. I am a fan of Mocha Light Frappuccinos… and when they have the mint version available, those can be even better! Except the chocolate chunks get stuck in the straw sometimes. A double-tall vanilla latte and slice of that pumpkin spice loaf cake with the ginger icing. Yum! Oooh…I’d get a big ‘ol skinny Carmel Macciato, stirred. Although I totally get your statement regarding the pumpkin cream cheese muffin, because I had one the other day and WOW!!!! YUM!!!! But, I would likely have a Grande Skinny Vanilla Latte, because I could have a couple of those a day….and my sister told me to try one blended next time I need a cold drink. So….Pick ME Please! $5 is almost enough to get a bottle of one of their flavoring syrups. I would probably get Almond for me, or Cinnamon Dolce for my spouse. Num num. Soon, very soon, the pepermint mochas will be back…decaf, skim, no-whip Venti!!! I would put it towards a whole box of Zen Green Tea!!!! My all time fav is peppermint mocha and I would have one of them with this card!! Yummy!! Of course, I’ll enter! I’m a coffee junkie! Sugar-free vanilla soy latte and blueberry coffeecake!! Have a great day! I would get a venti skinny cinnamon dolce latte, with a tip to the barista. That should take up the $5 (and maybe a little of the change in my pocket). Caramel machiatto. Or I might try some of their new breakfast stuff! I love Starbucks, so anything I got would make me happy! Hi, I’m hoping you pick me! I live in Canada, but will be visiting Buffalo to do some shopping on Monday, and I bet I could use a pick-me-up in the afternoon. I’d get a double shot of espresso, and pretend i’m in Paris. (I may have to close my eyes and use a lot of imagination!) Sorry, Buffalo…ers? Buffaloians? But besides a pretty decent mall, what else do you do in Buffalo? I would manage to get two meals out of it: I’d get my usual for breakfast (5 shots of decaf over ice, with a little chocolate & half & half mixed in, a.k.a. extra-shot decaf venti americano, no water; luckily I have the local baristas trained, so I don’t have to actually SAY this order), but then I’d treat myself to a Vivanno (orange mango, please) for lunch. Their oatmeal is actually pretty decent–it inspired me to get some Bob’s Red Mill hot cereals to keep in my drawer at work for breakfast. I would have a venti skinny sugar free cinnamon dolche dark roast coffee. I have too much weight still to loose and this would fit my flavour craving to a T! And no guilt trip ticket – I’m a travel agent for guitly pleasures. I would buy a pumpkin spice latte. Mmmmm! Or save it for a Peppermint Mocha closer to the holidays. I would buy a venti skiny caramel latte in the drive through so I don’t have to see those yummy muffins. As much seasonal, pumpkin-flavored, splenda-saturated, caffeinated goodness as 5 dollars will get. I would get either a Pumpkin Spice Latte or a Peppermint Mocha. Venti Skinny Caramel Iced latte, or “the usual” according to my favorite barista. Please! Fund my addiction! Nothing says fall to me like Carmel apple cider! MMMM… I would get the Spinach Feta wrap!!!! Venti decaf, non fat Latte with No foam….yum….! Iced cappuccino sounds cool and tastes great! definitely a strawberries and cream frappuccino. mmmmmm. I’d buy a skinny vanilla latte – my fave! Grande, non-fat iced latte. Simple, no-fuss. I would definitely try the Perfect Oatmeal…sounds yummy on a cool morning! Venti, non-fat, sugar-free Caramel Machiatto..a little less guilt and still tastes good..woo hoo! I’d get one of the new pumpkin spice lattes that I’ve heard good things about. I think you can get it light (I guess made with non fat milk?) for 4.5 or 5 WW points. This is a GREAT giveaway! I love Starbucks–and I don’t even drink coffee. I’d love to try one of the new breakfast sammiches– they look yummy! Pumpkin spice skinny latte — I love it when they’re in season! First of all, I love your site. And your story. And the way you tell it. Secondly, were I to win, I would buy as many Pumpkin Spice Lattes as $5 will buy me. MMMMM! I have been wanting to try the power protein plate or the oatmeal, but I might do my fall back drink of venti skinny cinnamon dolce latte. Yum, I’m going to get the Spinach, Roasted Tomato, Feta & Egg Wrap! I don’t really like Starbucks…I know, I might as well declare that I don’t like kittens are Christmas either. But, my dh loves him some good coffee, so I’m entering in the hopes of winning him a cup or two. Umm – I think I might have to try that pumpkin and cream cheese muffin with a tall white mocha latte – a special treat after having healthy oatmeal all week! I will have to say good old white chocolate mocha….if I get anything else even if it is good, I wish I got a white chocolate mocha. Same thing happens to me in restaurants with dinners. I am the Internet and I promise to love you long time if you pick me. Whatever the largest darkest cup of coffee is and I’ll dump some creamer into it. Let’s see….I’ll spend the remainder on a tasty muffin or cookie that has chocolate in it. I would buy a venti pumpkin latte (with skim). It would be such an indulgence for me that I would probably have to go to confession shortly afterwards. Thank you for your consideration. And for this very inspirational blog. I would buy a large vanilla soy latte & use whatever was leftover towards the oatmeal. And if you could bring it to me right now, that would be terrific. A venti skinny vanilla latte… yum! It has big taste with none of the guilt :). Cafe Americano. Nice and basic, and generally consistent in quality. I’m kind of finicky about buying prepared coffee products. I blame it on my 3 months of being a coffee barista years ago. I’ll have the Grande Salted Caramel Hot Chocolate please–with nonfat milk and whipped cream of course! Num Yummy! We do have Starbucks here in New Zealand although I have only ever been once.. I would have a hot chocolate, sitting in one of the velvet chairs in the window. Grande Non-Fat Starbucks Double shot on ice. Because caffeine is the only thing keeping me alive at this point. I’m a grad student who decided she didn’t have time for sleep no more. Honestly, if i could but an IV with caffeine in my arm, i would. I love the Vivanno line, the orange mango one, yum!! The oatmeal looks great too — I’d like to try it! I didn’t know they had that!! $5 Starbucks card = luxurious. I’m unemployed right now so the thought of a non-homemade brewed cuppa is like a dream. That said, I’d make my dollars stretch. At $1.90 each, I’d make two separate trips (in the span of 2 weeks) for a Tall Iced Coffee w/1 splenda and HH. And on my last trip, if I was a good hen and stuck to my workout plan, I’d use the last $1.20 towards a scone or fritter and then just sit there and people watch and read a book or something. That really is what I miss most about not going out for coffee. I’d have one of the new portabello mushroom piadini and an iced venti unsweetened black tea. I would buy a grande non-fat latte… and on a second trip, a venti shaken iced black tea…mmmm. :) I’m such a coffee/tea addict (it’s what I replaced soda with when I started losing weight). I’d buy a caramel macchiato for my fiance…because he LOVES them but only splurges on special occasions! Anything that says mocha in the title is my friend. I swore off the pumpkin cream-cheese muffins last year after I realized eating them every time I passed a Starbucks was getting too close to a habit … the kind you go to jail for. But I might finally get up the guts to try that new Perfect Oatmeal everyone’s drooling over. 2 grande americanos @ 2.38 each (including tax) = 4.76. And a little leftover toward a tip. But if I did get picked I’d have to hide it from my husband, I think they are having an affair. Ouch, I was supposed to write what I’ll order…This is what happens when I read blogs during my lunch break. So, it will be a tall caramel frapuccino (I don’t know if I spelled that right). I’m still debating on whether to get it with whipped cream. I’ll have one of the seasonal coffees such as Pumpkin spice or peppermint. I love them but only get it once a year as a treat. I may pay a little extra to add in a pastry, you never know, if they look good enough and I’m hungry. I would buy a large tea (1 teabag) and some oatmeal! A venti non-fat iced chai latte with 5 pumps OR since it would be free possibly a venti iced chai latte with soy milk. Milk has not been my friend lately, but I’m scared to try something with soy milk, but if it was free I might be more willing to try it out. I will buy my husband a latte and me a black iced tea. I don’t like coffee, but Oh. My. Goodness. These chai frappucinos are AWESOME!!!! I’d buy a liter of sugar-free hazelnut syrup (and pay the extra $2). My favorite: a venti mocha with extra whipped. :) MMMM It’s worth the points. Grande chai tea latte, extra chai (six pumps), extra hot, no water, no foam. Might have enough leftover to get that pumpkin muffin, too. If I were going for breakfast, I’d get a venti black iced tea, unsweetened, and then maybe a spinach feta wrap. Yummy!!! Not 100% sure what I would purchase with the gift card – something probably chocolate flavored with skim milk. I know….boring, but I can get wrapped up too quick with the really sweet drinks! Either plain coffee or a double short nonfat cappuchino. Or iced coffee, yum! I would buy 2.5 servings of the grande Pike’s Place Blend (2 dollars each)…each time, reminding myself how much more I liked the House Blend before they switched to Pike’s Place…and THEN I would remind myself that it doesn’t matter because at least I’m still getting my caffeine fix. Venti Sugar Free Vanilla Skim Latte, please! I love PQ! I love the Skinny Cinnamon Dulce Latte. Yum! Also, I would add a shot of espresso to their new choco-banana protein drink. I would be good to go for the entire day. It’s almost Peppermint Mocha season, folks. I don’t CARE how many calories/ carbs/ Points it has, darn it! It’s SO good. $5.68 buys me my once-a-week treat: the new fruit and nut bar (yum!) and a grande skinny hazelnut latte. Even Florida’s seeing some cooler fall weather — I should be having a warm drink soon instead of an iced one. Well… with $5 I could get 2.5 grande coffees…. 2 if I go all out and get a red-eye (coffee with espresso). I’d take my ten year old with me, let him get whatever treat he wants, and just hang out with him. We rarely get time that’s just us. Nonfat latte with SF vanilla please! @DonnaLynn – In fact, I think I’m going to do exactly that today anyway, no matter what! I would LOVE to have a card! Please pick me. Hi, I am an starbuckian wench…there on a daily basis. I would indulge in the grande non-fat caramel macchiato. A single drink of bliss that would also wipe out the value of the $5 card. P.S. I love the maple oat scones too, but it is a rare treat given it’s caloric nature. WOW, I rarely go, but LOVE their coffee. That’s what I’d get. I had no idea they had all that other stuff. Except Frappucinos. Which I’m sure have too many calories because they are too good. Though that might be a nice one-time treat, too. :-) But right now, I’m craving coffee. Maybe I’m moving from soda drinker to coffee drinker. Hmm. When the weather gets more coolish down here in Arkansas, I’d likely get a pumpkin latte made with soy milk. I would buy a 5 minute vacation (aka: peppermint/mocha latte). Ahhh, 5 minutes just to contemplate the perfect compliment of flavors. They taste like hot peppermint patties! There was a time when my answer was easy: a triple venti nonfat no-whip white mocha. Or, if I waited a month or two, an eggnog latte. Or one of those glorious cream cheese muffin or the oldschool peanut butter brick. Now, thanks to severe food allergies that limit my diet to practically nothing, I would get the blissfully simple iced vanilla latte. The leftover would go towards a bag of expresso beans to take home to the boonies with me to use in my vain attempt to create the perfect cappuccino! MMM-Hhmmm With the gift card I would buy the Power Protein Plate so I can feel powerful all day!! And then of course I would actually buy a chai tea latte with my hard-earned, hard-to-come-by cold-hard “cash”! I will give it to my daughter (14) who will order a double choc. chip frapp. with whip cream. Sigh~ to be 14 and slender again. It’s that time of year again! Pumpkin spice latte’! That pumpkin & cream cheese muffin sounds wonderful too. Grande Americano w/ one inch foam & 2 pumps Pumpkin Spice. Delight in a cup. I want to try those skinny lattes. Yum! I haven’t made it to Starbucks yet (despite driving by probably 10 of them on my way to work) to sample their pumpkin goodies, but it’s high time I did!! Iced Venti Unsweetened Iced Coffee and an Apple Bran muffin. Yeah, Starbucks!! My favorite thing there is a Strawberries & Creme Frappuccino. I would totally buy one of those new Vivanno drinks, probably the chocolate/ banana one! I would probably get my standard tall soy latte and maybe one of those amazing pumpkin muffins. I haven’t let myself have one yet but it has to happen sometime… It might as well be free! I am all about their pumpkin cream cheese muffins with a caramel apple cider. Yea for fall! I would have a tall iced cafe mocha and a perfect oatmeal. And if that’s more than $5.00 I will still be happy. No fat pumpkin spice frap. I’d have to try out the new make your own oatmeal…not sure what it’s called on their menu…but I’ve heard good things about it! I would buy a Tall coffee of the day and the turkey & swiss on wheat bread (and I think I’d have to kick in some change because I think that will exceed $5). This time of year, I’ll take a pumpkin scone and a grande skim latte. Yum! But come December, I love the egg nog lattes. I would get a Cappucinno (Venti) and a nice almond biscotti! Hope I didn’t drool on your blog! I’d get my FAVORITE treat… a Skinny Cinnamon Dolce Late. Mmmmmm. Wow, I haven’t had starbucks in a long, long time. I’m easily swayed by their Caramel latte and not the kind with the low fat milk, either. Venti iced green tea (unsweetened) and the “perfect oatmeal”– I’ve been wanting to try it! I would give it to my husband-in-a-week-from-now because he looves some decaf non-fat sugar-free vanilla iced double shot! I am ready to try their oatmeal. It is such as great idea for a fast-food breakfast — and I am one of those weirdos who really likes ‘real’ oatmeal but doesn’t want to take the time to make it. a venti ICED skinny cinnamon dolce latte. i heart frappuccinos. around the holiday season, they usually have a mint mocha one that is sooo delish. I would get a decaf Grande Mocha. Anyone remember the reduced fat Marble Coffee Cake from a few years ago? I LOVED it. Wish they’d bring it back. Actually, I would take this card and buy a Carmel Apple Spice for a friend. She was just diagnosed with cancer and we stop for one everytime I take her to a doctor’s appointment. OK, so I stumbled upon your blog since it was linked from another, which was linked to another….need I go on? Anyhoo…cool blog, and cool idea for a giveaway! I would get a tall skinny cinnamon dolce latte – my sunday morning treat every week! The internet loves you anyway! I have never been to Starbucks. :( Poor me. I am torn between the perfect oatmeal and the apple bran muffin. I would buy a Caramel Macchiato! Love me some skinny latte! Not being a coffee kind of gal, i would have to go for the spinach, roasted tomato, feta and egg wrap I’ve heard so much about! Hmmm…I think I would try something totally new that I normally wouldn’t try. Mmmm, since I just found out I am pregnant a few weeks ago and have known for months that I am terribly broke (insert devastated stock market photo here), I would lavish upon myself a … chai latte. Gettin’ REAL adventurous, huh? multi-grain roll with almond butter. yum! I read your book from start to finish last night. Over and over I thought, are you my twin or WHAT? I was 350 lbs my senior year of college. I was always heavy as a kid (165 in the 3rd grade) and my family was always supper skinny. By slowly exercising and cutting out the crappy food (never followed a diet!!) I made it down to 180 by my 26th birthday. My day of reconing came when I was breaking the bones in my feet trying to walk from the dorms to class. I also lost weight on a long slow decline, with no major gains. I’m now almost 35, so that’s 9 years of maintaining my new lifestyle. I had so many of the same experiences you did, that I was constantly saying to myself, “Yup….I know…” I even WORKED at Lane Bryant, although when I first stated I was too large to wear any of their clothes. Eventually I had to leave because their size 14 was too large, and my sales went down: customers thought I couldn’t relate to them, and snubed me. I swear I needed to wear a “before picture” button to convince them that I did in fact know what they were living with in our stupid world. I just want to let other people know, you can do it without diet books, doctors, surgery, etc. It’s slow, and it takes work, but many people have done it and so can you. Be patient and try to appreciate each and every small gain in strength and self confidence. If place your focus there, one day you’ll realize those pants are WAY too big for you. It takes time for your mind and body to become friends. Let it happen slowly and it will become permanent. Mmm, I love a misto with a shot of almond syrup. Non-fat caramel frappachino, but with whipped cream. And you said it almost took away the pain of the day? What happened? I find it incredibly funny/interesting how most of your posts have an average of 20-40 comments, but the second you mention “Free Giveaway!! !” 215 people (at the time of my comment), felt the need to try for free caffeine! Hilarious, I’d say. Love your blog/book/story! I would either get my old standby of a nonfat, sugar-free latte, or maybe go with my newish favorite of an Americano. I would love to try the oatmeal with the dried fruit added! My usual is a skinny decaf cinnamon dolce! Ooohhh! Pick me pick me!!! Grande, non-fat sugar free gingerbread latte. A girl’s got to have a little joy in her life, no? Iced Vanilla Chai Latte with nonfat milk! Would like a grande cafe latte. What would I buy? I don’t know as I have never been to a Starbucks! Can you believe it? My son just told me about a new caramel sea salt hot chocolate! Over 500 calories, but I’d like to splurge on it just once! I enjoy your blog and a Starbucks card giveaway is as good as dessert. id like to enter! I would like to try thier oatmeal and of course a non fat iced mocha!!!!! Mmm, grande nonfat no whip white chocolate mocha! Yum! I wish I had a Starbuck’s near me! If I won I would give the card to my sister so she could treat herself to her favorite coffee! Have you people seen their salted caramel hot chocolate things? I had one. A big one. It was incredible. And worth every single salty, sweet, chocolatey amazing calorie. Mint Mocha Chip Light Frappuccino! Pumpkin Spice Latte….no whip cream! Pumpkin Spice latte!! yummm I can smell it already! Hmmmm…I’d like to try their new oatmeal with dried fruit. Sounds good! Low-fat, sugar-free vanilla chai baby! Oh so good! I would buy coffee, just plain coffee and put 2 percent milk in it. Oh man, I’m so late in responding here! Now I stick to Awake tea with a splash of nonfat milk. I think I’d try the protein power pack. I saw it today when I was there, and was intrigued. Grande non-fat latte. It’s bitter enough at the start to keep me from gulping it down, but eventually melds into espresso-milk sweet goodness. Love your book by the way! Favorite snippet was the bit about licking the spoon with mint extract on it…or maybe the spoon with cat food, that was good too. Maybe I just have a thing for spoons? Anyway, it is a really fun read, even the bits without utensils. I would buy the mini half moon cookies they have. Venti non-fat chai with 2 pumps of mocha. If they had decaf chai I would be in Starbuck’s drive thru twice a day. I must try the pumpkin cream cheese muffins – sounds delish! As my boyfriend of three years finally takes me out ring shopping this month (since we both got decent jobs and can actually afford to look for expensive things like rings! ), we’ll buy two vanilla lattes on the way to the jewelry stores…. Mine will be soy milk, though, so my nose isn’t plugged all day! I would seell it at the door for $5 and then go buy a drink from a locally owned and opearated company. mmmmmm…tall, no-vanilla, one-pump-hazelnut, non-fat no-whip hot chocolate, please! I used to work at starbucks, and STILL dislike coffee, frappucinos, and espresso drinks, but lovelovelove the hot chocolate. And, as prissy as my drink sounds when I order it, I swear it’s actually quite simple! I’ll buy half a pound of espresso roast coffee. I would add 42 cents to it and get a Venti 5-shot 1/2 decaf latte. (My “regular”). Mmmmm. Skinny pumpkin spice latte and a pumpkin muffin! What I would want to buy is a Venti Carmel Frapaccino. What I would buy is a lousy Venti Decaf. Ooohh I will get something pumpkin-flavored! I get so excited when it is fall because I luuuurv pumpkin-flavored things! And so I would choose whatever was pumpkin-flavored that lit my fancy. Possibly accompanied with the pumpkin cream cheese muffin, only because your description made it sound delectable and when I tried it last year it disappointed me. Perhaps my expectations were too high? OK, so this just made my night! :) I love love love Starbucks and I’d have to say with a $5 Starbucks card, I’d buy a coffee for me and a friend and then sit and chat about what a nice person you are for treating us! :) I’m crossing my fingers! Thanks jennette! Mmm, Starbucks. I would buy my new favorite, the Chocolate Banana Vivanno, made with skim milk. It’s one thing I don’t feel guilty about having! i would get an iced grande soy starbucks double shot, a petite vanilla scone, and a single serving pack of almond butter. Top Pot Doughnut – Glazed Old fashioned and a cup of hot coffee. heaven. If I were selected to receive a gift card, I could buy 2 Venti Green Ice teas with no sweetner. Plus I would have $.80 left over. Please, please! there are so many people commenting on here .. wow. I would buy a skinny vanilla latte and a blueberry scone !! I have never been to a starbucks…i sometimes go by one on the way to work though and it smells so good. I think if i had to choose i would have a tazo tea, my sister swears by it. And a biscotti. Cause I’m italian and love them. And wouldnt even think about spending money like this without a starbucks card…I have a 3 year old and dont treat myself often. No doubt, I would purchase a tall White Chocolate Frapp. Doesn’t get any better than that. I might even go off the deep end and ask them to give me one squirt of hazelnut in it….just ’cause I’m crazy like that. I would buy a mango frappe because they are yum yum yum!! And I can’t usually justify spending $5 on a drink!!! BTW, I’m about to read your book for the SECOND time!! what could be better on a chilly fall morning! a tall skinny vanilla latte. the best indulgence i have found for the south beach diet! My current fave is a tall, with room Americano. I don’t like as much milk anymore (used to only get lattes). Bonus: Americanos are pretty cheap! Wow! Starbucks Pumpkin Spice Latte would really help this morning after looking at what the stock market did to the 401… agh! Pumpkin Spice Latte might make me forget to check the 401 this morning!! I really want to try the oatmeal at Starbucks! I’m dying to try the Protein Plate, so that. Or the Chocolate-Banana smoothie (Vivanno? I think that’s the name). Those make a great afternoon snack. A grande skinny latte, with sugar free syrup (probably vanilla). I love love LOVE these, but find them to be a bit pricy to be an everyday thing, and so make it more a healthy-ish treat. I would buy a Venti Skinny Cinnamon Dolce Latte! I absolutely LOVE starbucks. LOVE IT!!!! I had my son a little over 2 year ago, and EVERY DAY while I was pregnant, I craved Dunkin Donuts Coffee and a bran muffin (lets not talk about the amount of weight I put on). I also have a daughter who is 7 months old, and while pregnant with her, I craved Starbucks. Every day I would get a Venti Decvaf Soy Latte and a scone. EVERY DAY!!!!. It’s an addiction. I mean I just couldn’t wait to get off the train to buy it. My little caffeine fix!!!! So, my daughter is now 7 months old, and I still can’t shake off the habbit. This Starbucks stuff is awesome!!!! Gotta try one of those new breakfast sandwiches with egg, spinach & feta. Everybody is talking about them. I want one!!! Mmmm- we just got a Starbucks here within the past year or so but it’s not on my daily commute route so I rarely treat myself. I would definitely get my first Grande Chai Tea Latte (with vanilla and non-fat milk) of the season! One of my favorite parts of the weather turning cold again! Every time I go, they ask if I want that fabulous looking oatmeal in the middle of the afternoon! NO…not unless it’s a freebie! The internet DOES love you! I definitely want to try one of those Chocolate Banana Vivanno drinks. Starbucks is a rare treat for me, so I’d be thrilled to have an excuse to indulge! Decaf, nonfat, sugarfree vanilla latte. I sound like a monk or something but it works for me! Pick me! Pick me! Tall iced skinny caramel latte. ‘Cause when I try to do the cheaper (and less calorie) coffee con leche all that caffeine gets me hopped up like I’m on crazy bad diet pills. Yuk! Sadly, I do not enjoy the taste of coffee, but the smell is to die for. The card would be wasted on me…..oh, but wait, there are pumpkin & cream cheese muffins. yum….. That is what I would the card for. Thanks. I would buy world peace and happiness for all. Or a big ol’ Mocha Frappacino. I’m pregnant right now, so I only give myself a single coffee drink every three months. No tea or soda either! That drink, for the holidays, has to be an eggnog latte. I lurv me a Starbucks eggnog latte. I enjoy their Vivanno smoothies, especially the banana chocolate one. So that’s what I would buy! Pumpkin and cream cheese muffin sounds great! This is the competition of my dreams… who needs an Extreme Home Makeover or Biggest Loser game when you have a $5 Starbucks card hanging in the balance. an oatmeal w/a scoop of protein powder and either the mixed nuts OR brown sugar. It’s well-balanced, healthy and tastes amazing–especially in the crisp fall air. i love coffee :) i would buy an iced caramel macchiatto and a gingerbread latte, once the holiday drinks come out! Tall caramel apple cider – no whipped cream, maybe sugar free caramel syrup. Oh my FAVORITE FALL DRINK. Hot Tea, Man it tastes terrible, but after the first half of the cup, you have burnt your tongue so badly you cannot taste the second half anyway, and it has ZERO calories! Woo Hoo! A whole grain roll with almond butter = AWESOME. Promise I am not a brown-nosing health nut! I truly have been dying to try the oatmeal (with the nuts, not the fruit)…I just hate spending $2.90 cashola on it unless I KNOW it’s going to be well worth the cost. That being said, anything left over would go towards an Iced Grande One Splenda Skinny Caramel Latte (with caramel sauce drizzled on top)…. I would try one of the new Salted Caramel Hot Chocolates. I love the salted caramels they used to sell at Trader Joe’s so I’m sure I’d love this hot chocolate too. BTW…I love reading your blog, I never post, but read most all of them = ) Im constantly on and off again with SBD…so it helps me to get back on..sometimes. Im currently giving the Herbalife shake’s another try. Venti skinny vanilla latte…and I’d chip in a buck of my own to get a piece of the low fat cinamon swirl coffee cake. HEAVEN!! Ok, I’ll get one of those oatmeals. That looks so good! I’ll have a skinny tall cinnamon dolce made with sugar free syrup to go alongside of that. Yum! A Vente Salted Caramel Hot Chocolate! With Whip! Extra Hot! I would get the usual… skinny mocha frappuccino with a shot of peppermint syrup. Grande, Sugar-Free Vanilla Americano and (being the GIANT hypocrite that I am) a pumpkin scone. I’ll be good and get a white chocolate mocha in the secret “Short” size, with no whipped cream. That one’s only 200 calories. …But then the whipped cream is free, so turning it down would be wasteful. Okay, with whipped cream. I’m only up to 250 calories now! Oh, but look. The “short” one is only 30 cents less than the tall, which is one and a half times the size. I can’t pass up that value! Okay, 370 calories, that’s do-able. But wait, it’s the same price difference for “tall” to “grande”….and “grande” to “venti”….! Fine. With my gift card I’ll get a 580 calorie beast of a coffee…but only because Starbucks gave me no other choice!! Triple grande skinny Cinnamon dolce latte….and thanks for keeping it real on the blog…. I would buy that new sea salt drink they have. Though it sounds gross, a friend of mine said it was a little sip of heaven. And you don’t need to buy my love, Pasta Queen. 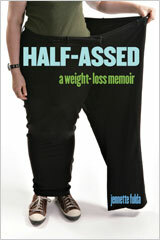 Because of you, I’ve lost 15 pounds! i love love the pumpkin spice frap , but usually limit that , and for breakfast i eat the turkey bacon , with light aged white cheddar with egg whites on a whole grain muffin :-) YUMMO! and if you dont pick me … i will still love you ! 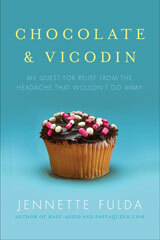 :-) i am loving your book right now ! I would buy 2 decaf coffee’s (I’m a south beacher also). I live in a college town (I’m a student) and there are 3 starbucks in about a 15 square block downtown area so I would definately use it. I want a venti caramal frappichino or some scones. Yummy, Yummy scones. Or what is that new chocolate banana thing? That rocks. I want to try the Perfect Oatmeal and a skinny cinnamon dolce latte, please. Try the pumpkin bread next time. You’ll be dreaming about it for days. I promise. I would buy a skinny latte with sugar free vanilla syrup. I’d wish it was a mocha of some sort the whole time I would be drinking it. Hey! I’d get either a peppermint mocha (fat free), a ff raspberry mocha, or a ff caramel machiato!! YUM! They are all so good!! I would try the salted caramel hot chocolate, that sounds very yummy to me. if it was a normal day i would get a tall iced americano. But if it was a special, treat-myself, I-won-a-contest-and-can-eat/drink-whatever-i-want-with-my-fee-money day i would get a tall pumpkin spice latte and an apple bran muffin. mmmmmmmmmmmmmuffins. Either a tall vanilla steamer or a white hot chocolate. YUM. My most delicious choice would be a GingerBread Latte that I savor every holiday seasion. I may even throw in a slice of GingerBread Loaf! I have honestly never been to Starbucks. *Gasp* I know! So, I would use this gift card (if I were to win) to try something new. #340 here is embarrassed to tell you I’ve never been to a Starbuck’s, although there is one 3 minutes from my house. I would go into the store, act like I’ve been there a million times, and order the richest, cream cheesiest thing I could find. Could I do that for 5 bucks? I want the pumpkin and cream cheese muffin!!! I would buy a peppermint mocha with the whip and a pumpkin cheesecake muffin, yummy. I would probably buy a skinny Cinnamon Dolce Latte. That drink is like drinking a buttery cinnamon roll. I love it. But I’ve been getting Hungry Girl’s emails recently and I’d really like to try the Spinach, Roasted Tomato, Feta and Egg wrap. It sounds really tasty. Well, since I don’t drink coffee … it would either be a peppermint hot chocolate with whipped cream OR some tasty pastry item. Pumpkin spice latte…its like candy in a cup. I’ll buy a chocolate banana shake. And I’ll schmooze with those managers who always go there on their coffee break. I would put it towards one of their beautiful starbucks travel mugs. Want to get on the eco-conscious bandwagon! I might buy a couple of iced americanos (double iced espresso over ice, no more ice, more ice! ), or a single french press to share with a friend, or some chocolate covered graham crackers, or maybe even a caramel frappucino, which I use as a reward after the dentist or the gyno. I live in Santiago, Chile, where they probably won’t accept the card, but my mom lives about a 23-minute walk from a Starbucks. So you won’t just be feeding my caffeine addiction, you’ll be getting me moving as well! I would like to try some of their breakfast items. The new oatmeal maybe? Pumpkin cream cheese muffin AND a pumpkin spice latte. Mmmm. Fall. Wow, you certainly became popular once you posted this giveaway. I would most certainly buy coffee with your card since I am a teacher and must be at work by 7:15 am. Congratulations, you won the popularity contest. A hazelnut soy decaf latte, iced!!! The big one! It’s my favorite. I check your blog daily! It on my igoogle page so pick me! I’d have to splurge and have my favorite, a mocha frappaccino. I read your book and came to check out your blog and found this. I would get a hot chocolate and an oatmeal. I’d get a venti Pike Place with 2 Splendas and 2% and 3 petit vanilla scones. Then I’d say I’d save 1 scone for later. Then I’d eat it anyway because they are like heaven. Thanks for writing your book! I’m nearly done and now I’m investigating your website. I know everything you’ve done started out for yourself, but you have become a role model for so many. Thanks!!! Venti Skinny Vanilla Latte. I love those things I really do. Yay! I would absolutely buy a Venti Iced Caramel Machiatto. YUMM! I don’t think I’ve ever commented before (see what the hope of free Starbucks will do to me) but I love your blog and book! Pick me, pick me! I’d order a Tall, Vanilla Bean blended cream frapuccino (sp? ), no whip. Mmmmmmm…. I NEEEEED that card! Right now Starbucks is the only place I can get Justin’s Nut Butter!!!!!!!!!! The choco protein shake thingy! I love how they make it with frozen bananas. Chewy Fruit & Nut Bar !!!! I would set my own needs aside and use it as a stocking stuffer! …with a note to thank and read PastaQueen, of course. Decaf, grande, breve, americano, and oatmeal with fruit and nuts! Whoa, I’m 372! Well, then. I live in New York, which is RIFE with Starbucks. In fact, I know of at least three within a four block radius of my office. So a $5 card would be put to great use in my hands. AND, I’d stretch that puppy out… maybe two venti nonfat mistos? They’re $2.71 apiece, so I’d be digging into the pocket change, but I’m prepared to weather that storm. Or maybe I’d hoard that card till the Christmas drinks come out and get myself a chocolately delicious peppermint mocha. Yum. OH, and can I add that I work, like, a block from Wall Street? Pick me and consider it your own personal Starbucks bailout! Yay, bail Katie out, hooray! Wow! what a popular listing! If you select me for the $5 gift card, I will march myself into the San Francisco starbucks on California st. across from the hospital, and pick out a fantastic reduced fat berry scone on the way to the madness that is my job!!! yay reduced fat berry scones! I’m torn between a: Tazo Passion iced tea, sweetened or Americano & chocolate croissant. If it’ll help me win some brownie points, I myself am in the middle of a weight loss mission. Already down from 230 to 210. I would keep my Starbucks card in my wallet for a day I will forget breakfast. It will happen inevitably and I will whip it out and buy some of the new oatmeal. I had it once and it’s not bad. I don’t even like oatmeal usually, but theirs isn’t too fakey. I would get a white chocolate peppermint latte, decaf. Why wait for the holidays? Thanks, PQ, for the contest. One of those new hazelnut cocoas … as soon as we get a cool front. Yum. I’ll buy my usual Friday treat – a Skinny Cinnamon Dolce Latte. I would get my favorite any day drink, an iced grande americano with 2 splenda and a little skim milk. Or I would save it for my very favorite Starbuck’s drink a grande gingerbread latte! So ready for fall and my GBL!!! decaf triple venti soy latte and a petite vanilla bean scone…or maybe the new oatmeal and a tall decaf soy latte. mmmmm. A grande hot coco!!!!!! With whipped cream! I would have a skinny latte with a skinny blueberry muffin. Unfortunately, where I live it costs 7.40 euros which is lots more than 5.00 dollars but worth every penny. So many choices, so little time. Probably just an Iced latte with skim milk.. Triple tall soy latte with a sprinkle of cinnamon on top! Yum! A berry stella with passion tea. YUM! Tall iced Americano, and a green smoothie! I would give the card to my husband so he can get his Americano with Half and Half and Splenda. BTW, I just finished your book and it was AWESOME! Loved reading it. I’ll get my standard – a skinny cinnamon dolce latte. And maybe I’ll add on one of those berry stellas – they look so pretty but I’ve never gotten one yet! Pumpkin Spice Latte w/ a pumpkin scone – there’s nothing else to get this time of year. Nothing! Light caramel Frap. Soooo good! Forget all the other stuff. Just give me the biggest strongest cup-a-coffee they’ve got to get me through the dreaded morning meetings. Iced chai latte with vanilla and a warmed bear claw. OMG. Best combo EVER. So many goodies, so little time!! I would buy a delicious caramel frappucino and the cranberry bliss cream cheese bars. Pure heaven.